We returned to our Parish Church building for worship this morning after the completion of work on the church roof. It has taken us ten years to get to this point and we’ve been away from the building for the past nine months or so, but it’s fair to say that everyone present was taken aback by the transformation. It’s great to see the old place looking so new! 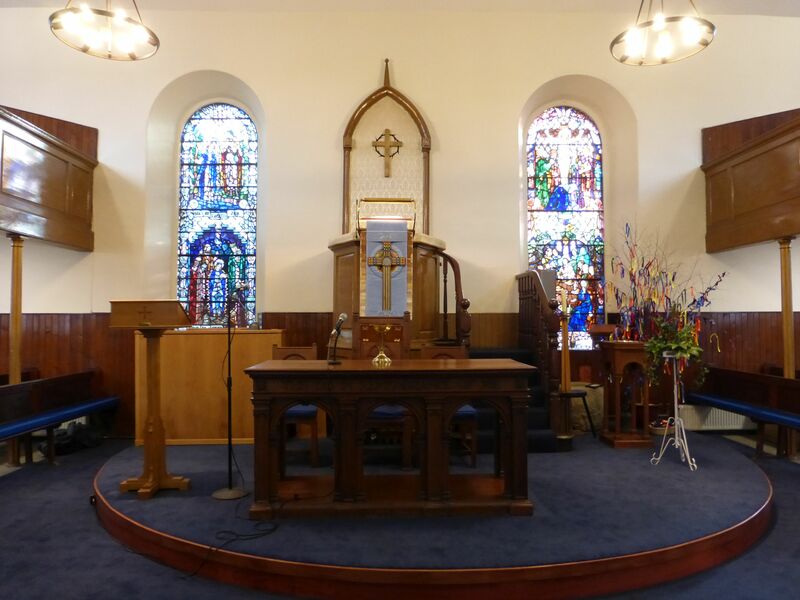 Worship services take place in the Parish Church every Sunday at 10.15am and at the Forge Community Centre, Balloch at 11.45am. You are assured of a warm welcome at either service. This is the title of the new Cumbernauld Old Parish Church Cookbook which is a selection of favourite recipes suggested by members of the congregation including starters, mains and, of course, plenty of sweets! It’s another great fund-raising idea for Cumbernauld Old from Elizabeth Snedden and Anne Morrison – and it’s a snip at £3, so please get your copy now from either of them. Project ROCK update – and it’s good news! We are delighted to announce that, all being well, we will be back in our Parish Church building for our 10.15am service this Sunday 26th January. It has been a long time coming, nearly nine months, but barring any last-minute unforeseen circumstances we’ll be back in the church building for worship in just a few days’ time. Our 11.45am services continue, of course, at the Forge Community Centre, Balloch and we’d be delighted to welcome you to either of our worship centres on Sunday. The annual Men’s Group Burns’ Supper will be held on Wednesday 22nd January in Cumbernauld Bowling Club at 7 for 7.30pm. This year’s line-up has changed and our speakers will be Calum Cormack, Chic Scott, Tom Johnston and Anne Walker, with David Boyle singing, Craig Whyte piping and Janet Graham on accordion. Hope that has whetted your appetites! Tickets priced £7 are available from members of the Men’s Group. Hope to see you there for what should be an entertaining evening. On Wednesday 8th January the Men’s Group meet at 7.30pm in the Roadside Hall in Cumbernauld Village. The guest speaker will by Jimmy Rexter who will be speaking about the humour of the Fire Brigade. On Thursday 9th January the Ladies’ Group meet at 7.30pm in the Roadside Hall for a Beetle Drive. All ladies are welcome to come along and blow away any January blues. Also on Thursday 9th January the Boys’ Brigade Anchor, Junior, Company and Senior Sections resume at their usual times in the Forge Centre, Balloch. Our first Messy Church of 2014 takes place next Sunday 12th January in the Forge Centre, Balloch with a new start-time of 3pm and aiming to finish around 5pm. We’re starting off the year by looking at some people and stories from the Bible – January’s theme will be ‘Noah’ so expect some animal-themed crafts and songs, and perhaps even a wee surprise with our food near the end of the afternoon. The Ladies’ Circle restarts on Wednesday 15th January at 7pm in the Forge Centre, Balloch with a Games Night. However, don’t panic – these are all table-top games and nothing strenuous will be involved!